One of the go-to dental procedures is dental bonding. This procedure was originally intended for filling in cavities found on the teeth that appeared along the smile line. However, as dentistry began to improve by leaps and bounds, the procedure has received a handful of other applications. Dental bonding is also known as tooth bonding. Basically, this procedure involves the use of composite resin material which is attached directly to surfaces of or crevices in the tooth. The material used in dental bonding procedures is a composite resin which is suitable for the treatment because of a number of advantages including it’s increased ability to bond with calcified tissues as well as the fact that it has the same color as teeth. Bridging dental gaps. Diastemas, or gaps in between teeth, can affect the aesthetics of your smile. However, a simple dental bonding procedure can widen the two teeth so that the gap can be eliminated. Dental veneers. Porcelain veneers can help to perfect the appearance of your teeth. However, these dental works can be rather expensive and they require two visits to the dentist, which are both spaced weeks apart from each other. But the beauty of dental bonding procedures is that they can be accomplished in just one visit to the dentist because the veneers do not have to be fabricated. Correcting imperfections. Minor imperfections like having a chipped or fractured tooth may not affect your dental health as a whole but it can definitely affect your smile. For this reason, most individuals with these dental imperfections often opt for a cosmetic dental procedure, and dental bonding is perfect for addressing these issues. Unlike porcelain veneers which actually destroy teeth in the process, dental bonding is a more conservative method of correcting minor dental problems. Filling in cavities. The dental bonding procedure’s original purpose, composite resin material is used to fill in cavities found along the smile line because of its teeth-colored appearance. Unlike using amalgam, which is silvery in color because its metallic components, the use of composite resin makes the dental filling procedure less conspicuous. 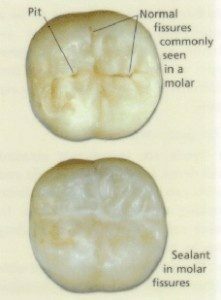 However, composite resin is not just confined to the front teeth but it can actually also be used to fill in cavities found on the molars of teeth.